Join the discussion on our forums! 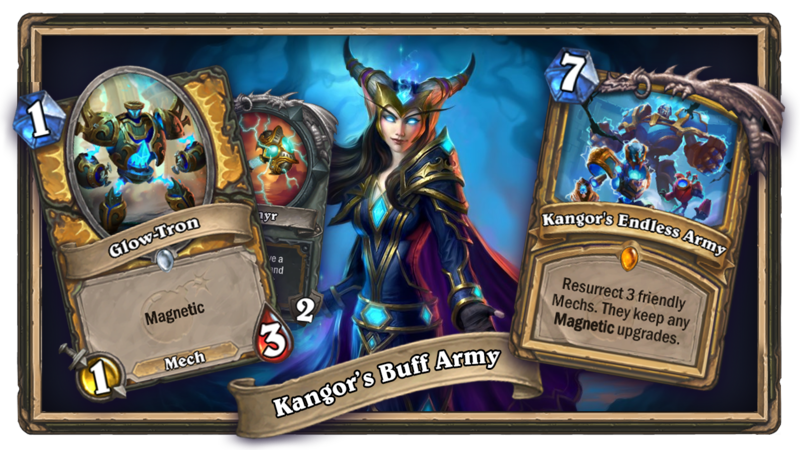 Come discuss Crystalsmith Kangor over in our dedicated Crystalsmith Kangor discussion topic. He wants to tank, but Boom always makes him play support. Wish granted High Priest Tekal. I found a lot of success with Kangor. In a control Paladin deck run with Chillblade Champions, you can make a huge comeback on health. Biggest problem this decks with now is Zoolock as you might not be able to get board control fast enough. I don't own Kangor, but I did play against a handbuff paladin using him and it seems to work really good in a deck like that. He had been buffed to 4 attack and I couldn't kill him without attacking it, so he ended up healing my opponent for 16 (4*2 to clear divine shield and 4*2 again to kill it). Could also be really good with Corpsetaker which also got support from Zilliax this expansion. bad, control paladin doesn't have a strong enough late game, and there's not that many good paladin heal cards, just think of that 6 mana 3/8 or something that deals damage when you heals. That card looks a lot better than this one on paper and it's garbage. 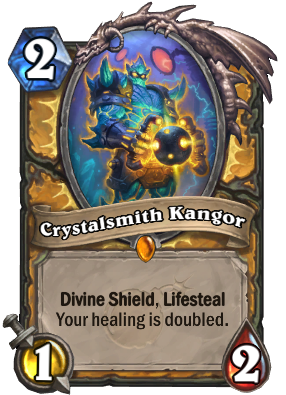 It's and awesome card, but it might not be the right time for Crystalsmith Kangor. This could exceptional in a deck that runs Corpsetaker, though. He's not this fantastical bombastic card, but at the same time, he's just a really solid 2 drop. I'd include him in just about anything. At his base, he's a 2 mana red flag target that has to be addressed, especially late game. On his own, he provides a minimum of 4 healing if they don't run something to remove him outright, in which case you just scored a likely tempo gain on your minimal 2 mana investment. You don't necessarily have to build this hyper-healing deck to get use. A Truesilver Champion nets you 4hp. Vicious Scalehide nets you 2. Benevolent Djinn gets you 6. Do people run all/any of these, and is it a better option than odd pally? To be determined, but not everyone likes to just dump dudes on the board. To me, he's like The Glass Knight in that he is just a solid card. You won't likely craft him, but if you pull him in a pack, you won't have to be upset. He's not as good as the one mana mage elemental that gives armor for each mana spent on spells (and he is legendary). He's not really re-playable... You make a big heal once back to 30 and then he has 0 value. The only way i see this card played is in decks that use buffs like the quest paladin. That deck really can capitalize on cheap divine shield/lifesteal minions. This is going to be really good in Wild with Forbidden Healing. There is one minor change that would turn this guy from "meh" to busted and must-kill. Instead of doubling your healing, make him read "when you heal, you also gain that much armor"
I think it's best synergies are with neutral minions like Fungal Enchanter and Shroom Brewer. For 5 mana you could play Darkscale Healer OR you could play Fungal Enchanter and this new card and get twice the healing, the same stats, and 1 divine shield. Turn 6 you could Spikeridged Steed and turn 7 you could Earthen Ring Farseer and this new card to heal back 6 on the Spikeridged target and put 4/5 worth of stats and divine shield on the board with 2 mana left over. Lay on Hands , Holy Light , spellstone and blackgaurd will still be unplayable though. Heals that don't help your board are kind of useless right now, and spellstone's trigger is hot garbage. I see so many bottom of the barrel kindergarten analytical statements here when most of you should be asking questions instead. This card doesn't seem strong however if u think about it he is like cheap Reno Jackson if u build your deck with healing in it and it surely it will work really well in that type of deck . So it might see play in Healadin/control paladin decks. This guy is very obviously a mech, isn't he? Or is he just a guy in a robotic looking suit?